There’s something that’s viscerally appealing to brightly coloured food. Maybe it’s the resemblance to beautiful flowers, or maybe that it strikes the more carnal pleasure centres… the flushed pink and blush red. In any case, brightly coloured food is not so easily obtained without the harsh and dangerous chemicals we’ve engineered to be “food safe”. But xoi gac aka red sticky rice, one of my favourite breakfast foods ever, gets its signature vermillion from baby jackfruit. Some makers use a combination of red and yellow food colouring to give it an orange hue, but you can tell when it uses baby jackfruit when there are seeds (from the jackfruit) and when the colour is not quite so even. You can also see bits of the fruit pulp in between the rice grains, while artificially coloured sticky rice will just be orange and plain looking. There’s only a subtle flavour of sweetness, either brought out more with sugar or contrasted with salt. Some makers will make it much more savoury or even more sweet, my recipe sits in the middle because I like it a little sweeter but not cloyingly sweet that my family cannot eat it with Vietnamese ham. 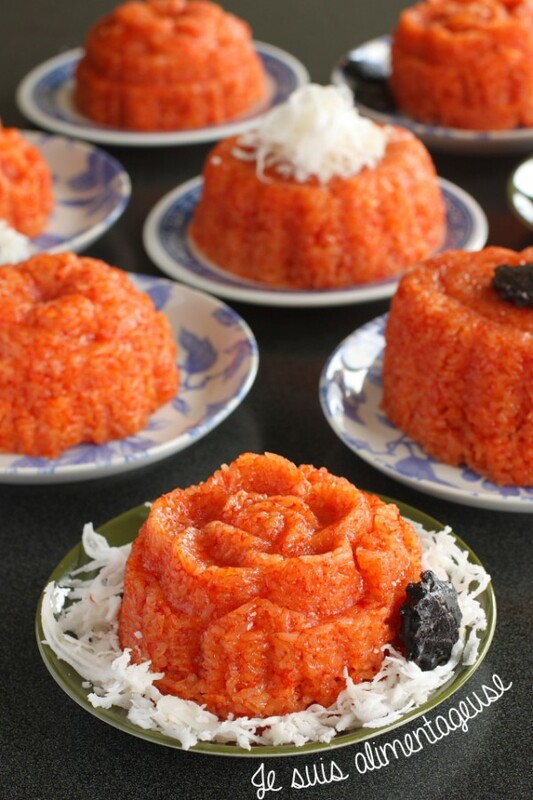 They make this a lot for special events like weddings and Vietnamese New Year celebration because the bright red colour is lucky in Vietnamese culture. That’s why Vietnamese and Chinese New Year share the same red envelopes used to give lucky money, and it’s used just about everywhere during the first couple months of the year. Think of how Christmas is basically red and green shoved in every place possible, but replace that with gold-laced red. New year is supposed to start with as much luck and good fortune as possible. It’s funny that the Western colour for luck is green, while less positive connotations like greed come to mind when green is used in Vietnamese culture. Funny enough, green is common in both cultures when it comes to envy or jealousy. I wonder why that is. Growing up, I associated green with cold and selfishness until I was introduced to the Western associations of colour. 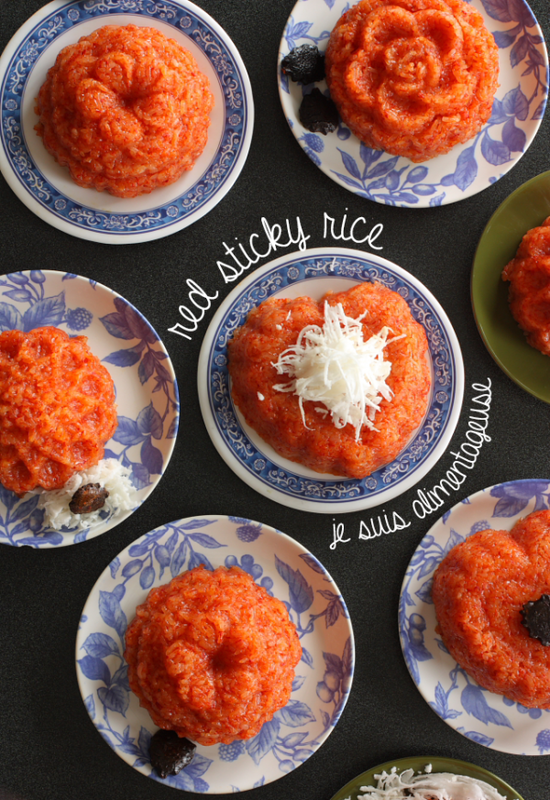 There are lots of other types of sticky rice (I’m sure they’ll show up here at some point) but the main common ingredient is glutinous rice. Worry not, celiac and gluten-sensitive friends, this rice is like any other rice in the sense that it’s gluten-free. It’s just called glutinous because it is “gluey”. Hence the sticky rice moniker. This is my last post of 2013, and I want to truly thank you for reading along with JSA! It’s been a wonderful year with so many new things and changes, and I couldn’t have done it without you guys. Happy New Year! Chuc mung nam moi! The picture shows a doubled version of this recipe. Rinse and drain sticky rice twice to clean the rice. Soak the rice for 5-6 hours in cool water or 2-3 hours in warm water. Transfer to a strainer and let drain for about an hour. Mix the drained rice with baby jackfruit paste and seeds until well coated. Let sit for about 30 minutes. Meanwhile, fill the bottom layer of a steam pot half full, set the steam layer on top and cover with the lid. Heat to a rolling boil while the rice is soaking in the baby jackfruit paste. Transfer the rice and baby jackfruit paste mixture (with seeds) to the steam pot layer, spreading evenly. Lower to medium heat, cover with lid and let steam for 10-15 minutes, then use sturdy wooden chopsticks to stir and bring the bottom rice layer up (for even cooking). Cover and cook again for 20 minutes. Add sugar, salt, and olive oil to the rice, stirring after each addition with the chopsticks to break up the rice and mix each ingredient into the rice. Cover and let steam for another 5 minutes. Remove the steam layer from the bottom layer and set uncovered on a wire rack to cool for about 10-15 minutes. To shape them into moulds, first coat your clean hands with a little bit of olive oil to prevent the rice from sticking to your hands. 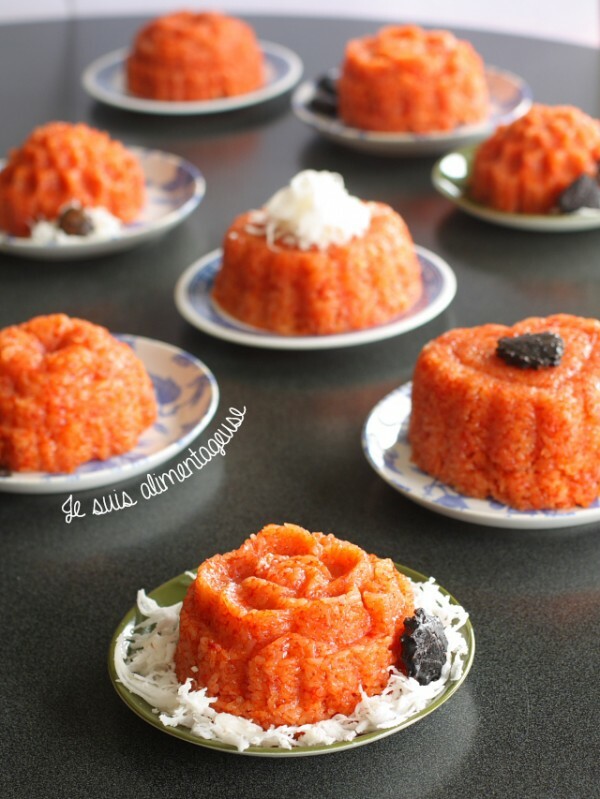 Press them into the moulds (jello moulds or mini bundt pans work too). If you don't have moulds, use small bowls to section them off instead so it's easier to eat later (it gets super sticky as it cools). Where do you buy jack fruit paste for the coloring? Any 99 Ranch shops? If so what aisle, as I am afraid I will get little help from the store, if it's not too obvious? Never heard of this before so your help is appreciated thanks! Can't wait to try it! I got the baby jackfruit paste in the frozen food section of Ocean's market. They're in kind of small, translucent pot/containers. Sometimes it's close to the frozen fruit or fruit pops, but it depends on the store. Hi Lisa, Thanks for the reply! Is Ocean's market in So Cal? I live in Nor Cal now and I was at the 99 Ranch earlier today and could not find it. I'm going to check the frozen food aisle next time (hadn't seen your comment yet). I looked it up on Amazon and it was $22 for a small bottle! I made the dish for the first time today without the jackfruit paste. I'm thinking it needs to be slightly sweeter. Good first effort though but I do want to try it with the jackfruit paste. Thanks a bunch! Where did you get the rice mold?